Are they chasing each other or just out for a frolic in the field? 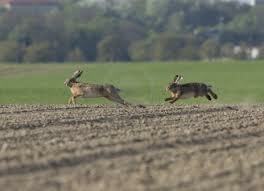 The two hares were tearing across the ground ducking and weaving like rugby players making a break for the line. The chase continued into the adjacent field and then there were three of them! A third had appeared close behind the pursuer, who turned on a sixpence, leaving the one he’d been after to disappear over the hill and faraway and started a fresh pursuit of the newcomer. Through the hedge and back into the first field, round and round–March hare-like–until they disappeared out of sight. A welcome distraction from disappointment. Just before the hares were spotted, a slip of the hand and crash–down they’d gone. Habitual breakfast mug and coffee jug crashed to the floor–caput. Then the clear-up, in a shocked silence, while it sank in that the little brown jug– chipped and cracked from years of service–had poured its last cup…. Handmade by our favorite local potter who has since retired. Irreplaceable. It’s imperfections just added to its charm. Are you sure? I said, slotting the two large pieces together–they fitted perfectly. Our friend, Donald Douglas, Captain McNeil from Poldark days and a neighbour now– is an extraordinarily skillful repairer of people’s cherished crockery. The missing “chunk” was already in the bin–in too many pieces for even Donald to work his magic. Clear up and move on! We said it almost simultaneously and made a fresh pot of coffee in our new “habitual” pot!! I love it when you share with us the everyday events of your life in France–and I am quite unlikely to see frolicking hares (or even sedentary ones) here in New York City. It is looking like early spring where you are. However, I am immensely relieved that this blog post wasn’t a recipe for jugged hare. I missed a trick there on the “jug” and “hare” connection! Here’s an idea. Incorporate those cherished shards into a planter arrangement. Is it awful that has I looked at those hares leaping across the field I was thinking dinner? So sorry about your cherished jug, I’ve learned to mourn quickly and move on it situations like that. I love the hares running through the field! It’s like losing an old friend…………your beloved coffee pot! Yes, we must move on…’tis life! Soon your new one will be your friend! Happy sipping! How joyous to be able to see wild life in play. We did see the the other day an alligator while watching golf from Florida. Just being facetious! We too have lost fond items to memory. Have a wonderful week-end. Or you could glue the pieces together and then put a smaller container inside to serve as a vase! I read really quickly and was first afraid you had broken a leg! Much better that it’s a jug. Those March hare’s chasing about in your fields having fun are lucky, we have got the wet snow and cold back.Maybe the french rugby team should take some lessons from them, what has happen to them?mind you Slaford are not just as bad, that new stadium has done them know good at all. So sorry that you have both lost your beloved coffee pot,it’s always sad to break an old friend,and it’s always that one – never one of the others in the cup- board, I’m sure that your new one will soon be as good friend as the other. As Demetra suggested — you could make the pieces into a mosaic, possibly a trivet to grace your table? The loss of a habitual coffee mug would make ME as mad as a March hare!! There are only certain mugs that qualify–and only a ceramic one with a good mouth-feel. Thank you for this post – a lovely reminder that Nature has daily delights for us if we just open our eyes and pay attention! Sorry to hear about your favorite jug. Enjoy the new one! My March hare story of this a.m. didn’t lead to breakage, but has temporarily (I hope) flushed a Mourning Dove from its nest where it is sitting on eggs. What happened was that as I sat down at my desk with morning tea, I spied a big rabbit outside eating goodies from my yard. All the fencing expensively installed to keep rabbits out seems to be no impediment to their invasions. Anyway, I rushed out the door and scared the rabbit away — but also frightened mama Mourning Dove from her nest. That was half an hour ago. I was beginning to worry about her, but as I write she has just returned to the nest. Thank Heaven! Mourning Doves have never nested outside my office before, though Scrub Jays do so every year. This has been a fascinating experience, beginning with observation of an intense courtship, followed by frenzied nest building. About a week ago Mom and Dad began taking turns sitting on eggs in the nest. Should be about 10 or 12 days before the eggs hatch (if Wikipedia is right). Moral of the story, I guess — let the rabbits eat whatever they like! It sounds like a case of ‘hare today – gone tomorrow’ for both creature and jug! on March 10, 2013 at 7:19 pm | Reply Dianne P. Bunnies!? Yay!! Not brainless, though! “Over the hills & far away…” tune from “Sharpe’s War,” perhaps? Great series!! It’s a sheer joy and a “soulagement” to learn that there’s still a “spot” on this Earth where even hares can roam and play freely without someone making an attempt to destroy them. Thank you, dear Robin and Meredith for the photo and for the very thoughtful words. Wonderful photo and description of the Mad March Hares – it’s really special to see something like that and thank you so much for sharing it with us all – please can we have a video next time ?! 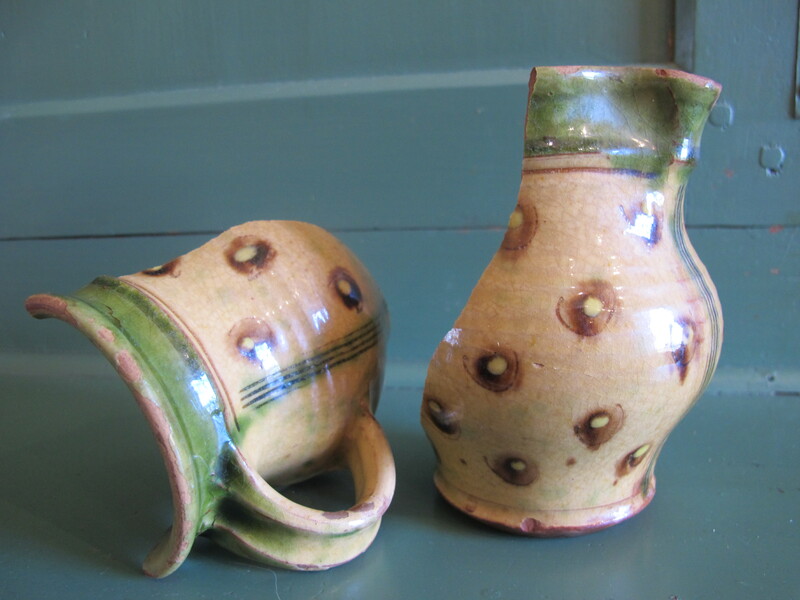 (I too did a ‘double take’ when I saw the words ‘hare’ and ‘jug’ in the title…. hardly dared read on!!). 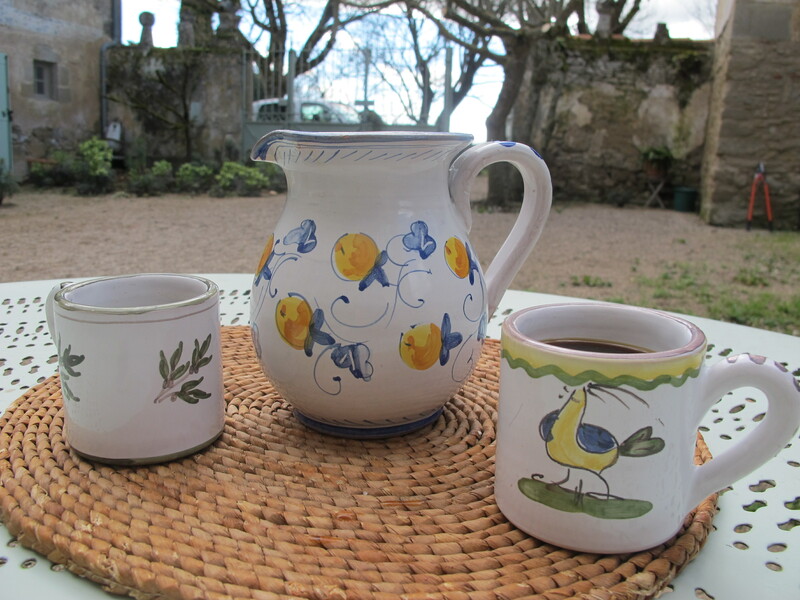 Sorry about the loss of your favourite jug though – always sad to lose a comforting ‘old friend’ – though acquiring new ones can be nice too. I just recently acquired a lovely ‘rustic’ painted pottery dish, for pasta-type meals, and today took delivery of a very nice looking little bamboo chopping board, with curved surface, and ‘mezzaluna’ herb cutter (‘hachoir’ in France?) – as you seem to have got me very into using fresh herbs (may have to start growing my own – but indoors, as it’s a bit too traffic-polluted here and a non-private garden area). Time to prepare lunch I think, chop chop…. Hello Elizabeth–good to hear the food nourished such a distinguished and unusual discussion! Poor Milman Parry, I read, died prematurely (35) when a pistol he was carrying in his luggage went off accidentally or so it says. Hope the week of recipes continue to please!